In this 1993 file photo originally released by Columbia Pictures, Tupac Shakur is shown in character in a scene from "Poetic Justice." A hip-hop mogul wanted by federal authorities on drug charges did not orchestrate a plot to ambush rapper Tupac Shakur outside a recording studio in the mid-1990s, his lawyer said Thursday. The accusations against James Rosemond, owner of Czar Entertainment, were levied online and attributed to convicted killer Dexter Isaac, who is serving a life sentence in an unrelated murder-for-hire plot. Isaac says, according to the website AllHipHop.com, that he was paid $2,500 by Rosemond to shoot and rob Shakur. Shakur was hit five times in the shooting at the Quad Studios in Manhattan in 1994. He survived but was later gunned down in a slaying that remains unsolved. 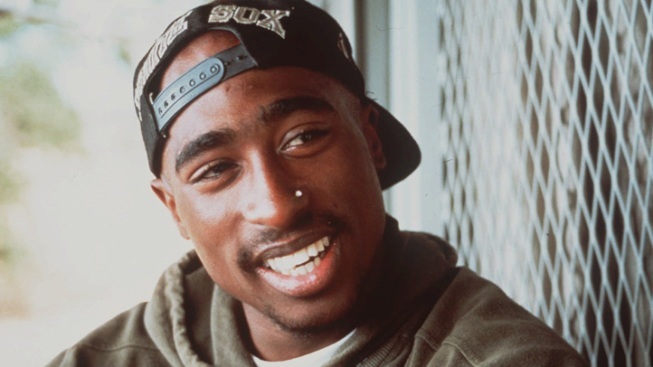 The mystery surrounding Shakur's death in Las Vegas has fueled interest in the smallest of details about his life, as well as the old-school feud between East Coast and West Coast rap that some say contributed to his killing. Isaac stole jewelry off Shakur and handed over a diamond ring to Rosemond after the late-night ambush, the post published Wednesday reads. "I still have the chain that we took that night," he wrote, according to the post. New York City police were investigating the claims, though it's not clear if anyone would face charges, in part because the incident occurred about 17 years ago. Rosemond is wanted by federal authorities in New York on drug charges and as of Thursday remained a fugitive. His lawyer, Jeffrey Lichtman, could not comment about the federal case against his client. But he said the accusations posted online were lies fabricated because Isaac is upset he was outed as a government informant. "This is a guy who is a blood-thirsty killer, trying to work off a life sentence, and for some reason his accusations are taken as fact?" Lichtman asked. The post is rife with bitterness directed at Rosemond. "Now I would like to clear up a few things, because the statute of limitations is over, and no one can be charged, and I'm just plain tired of listening to your lies," according to the post. Isaac was convicted in the 1997 murder-for-hire shooting death of cab driver Waleed Hammouda. The victim's wife, Micheline, offered Isaac property in exchange for killing her husband. She was also convicted. He is serving life in prison and was transferred earlier this year to the Metropolitan Detention Center in Brooklyn from a prison in Colorado. An employee at the Brooklyn detention center said inmates were not allowed to receive calls and were allowed only approved in-person visits. In order to be approved, a person must first write to the inmate and receive a visitor form. It wasn't clear whether Isaac still had a lawyer, and a call to the website wasn't returned.